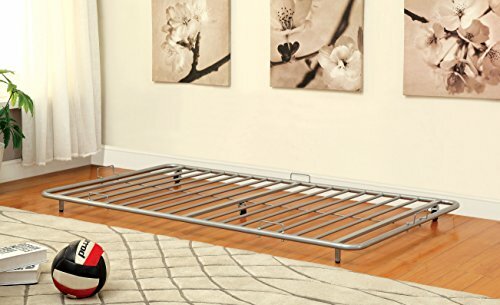 The Furniture of America Newton Metal Twin Trundle is a great addition to any child's bedroom! This piece showcases a sturdy metal frame for long-lasting quality, with slatted supports, convenient handles, and caster wheels for convenience. Accommodates Twin size mattresses. Available in a variety of fun colors. Made in China, assembly required. Overall dimensions: 74.5"L x 40.375"W x 5.5"H. All décor and items are not included in this offer unless specified.